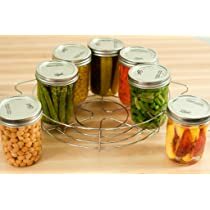 Canning is an economical way to preserve fresh quality foods at home while retaining their important vitamins and nutrients. 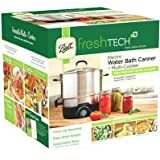 The right equipment is essential to ensure a quality product and Granite Ware offers all the basics for blanching produce for the freezer or for cold pack canning. - Porcelain surface with durable steel core provides excellent heat distribution, reducing time and energy. 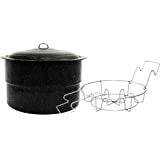 - Includes jar rack with contoured handles to allow for easy lifting and resting on pot rim. 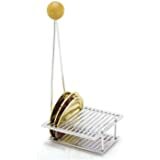 - Can be used on gas and electric; not recommended on glass cooktops. 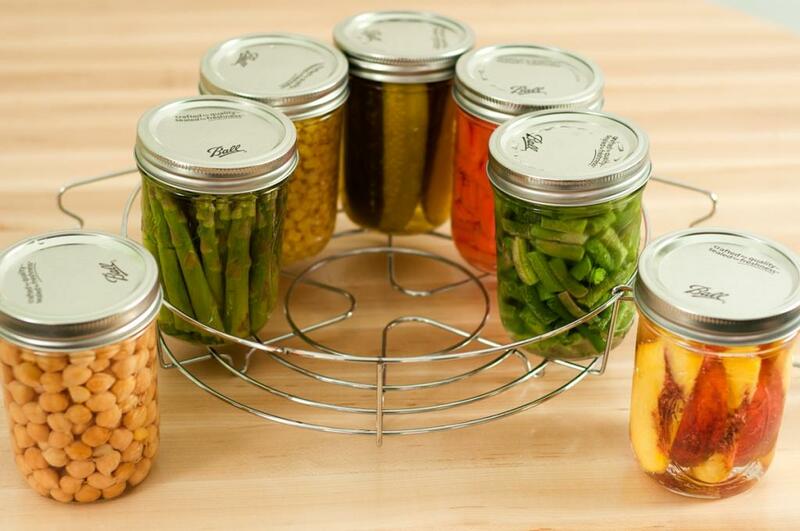 To Save Money: USDA estimates one can save up to 50% by canning food rather than buying it. To Preserve Food Until Its Needed, Without Refrigeration: Freezer and refrigerator space is limited and consumes energy. Canned food simply needs a cool dark place. To Buy Local and Eat Healthy: One can buy locally grown fruits & vegetables at Farmer’s Markets and preserve them without added chemicals. Popular trend in urban & suburban neighborhoods. 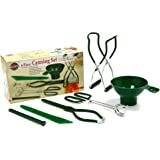 To Make Unique, Personalized Treats/Gifts for Family & Friends: Preserves, jellies, pickles, relishes, salsas and chilies. 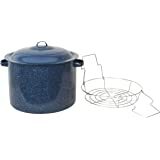 Granite Ware water-bath canners have been the standard for canning for over 100 years. The stepped design of our canners produces more even heat by allowing more boiling water contact with the top half of the jars. 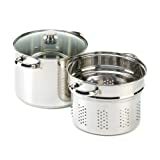 Used to elevate food temperature above 212-degrees Fahrenheit for 15 minutes or more, which kills all the bacteria found in high acid fruits and vegetables. 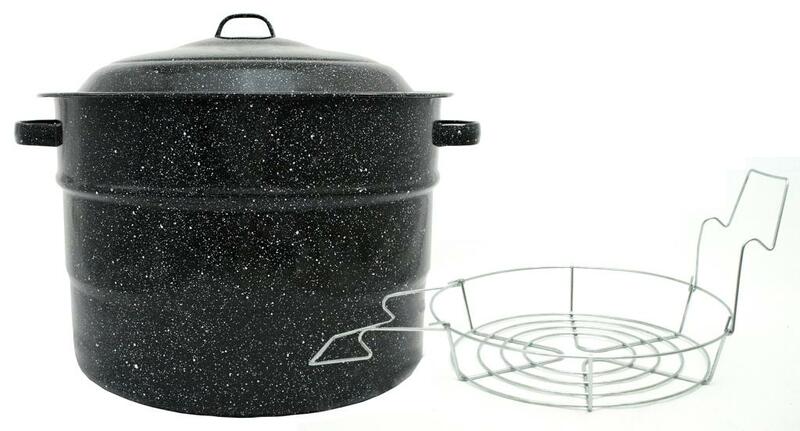 The water-bath canner creates a vacuum seal when the jars cool, sealing out air and bacteria. Granite Ware Canners come in multiple sizes to fit your needs: 12-quart canner (#0706) that holds 7 one-pint jars; 21.5-quart canner (#0707) that holds 7 one-quart jars or 9 one-pint jars or 12 half-pint jars; 33-quart canner (#0709) that holds 9 one-quart jars or 14 one-pint jars or 17 half-pint jars. 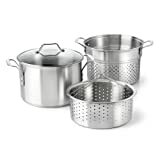 Additional equipment available: Blancher with drainer insert (#6140), Preserving Kettle (#0703), Colander (#0713), 5-Piece Canning Tool Set (#0720) and Silicone Jar Toppers (#0723 & #0724). Assist handles for easy lifting. 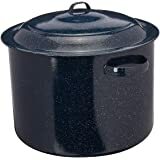 Originally founded in 1871, Columbian Home Products is one of the oldest cookware manufacturers in the U. S., famous for producing Porcelain on Steel cookware. 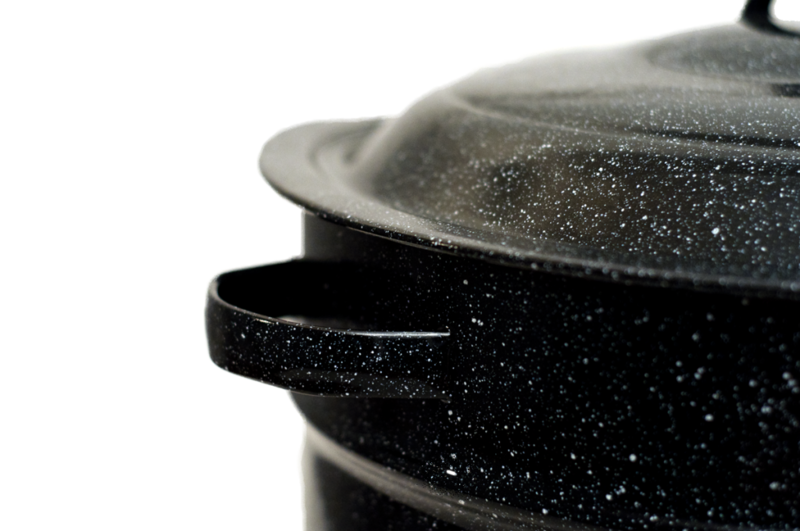 We have been producing Granite Ware cookware in our Terre Haute, IN facility since 1901. 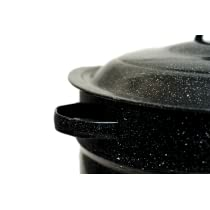 Granite Ware has a carbon steel core for strength, conductivity and superior heat distribution. Porcelain is fused to the steel at 2,000 degrees Fahrenheit producing a non-porous, inert glass surface that is naturally non-stick. 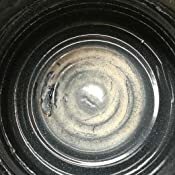 Porcelain can chip if dropped, however this does not reduce the effectiveness of the cookware. There are no PTFE’s, PFOA’s or any other chemicals to change the taste, color or nutritional value of the food. Rack holds 7 one-quart jars. 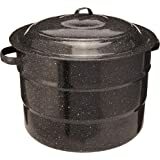 I've had a Granite Ware canner that my mother used. It has to be over 50 years old. Now my daughter and I are sharing it as she enjoys the first big harvest from her garden. 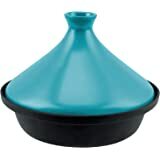 When I saw this offering at such a price, I was delighted and bought one for my use. The rack that is included is the one that allows more pint and half pint jars, and it has an extra support for the smaller jars, so there isn't tilting during processing. 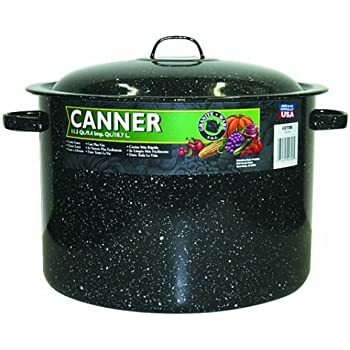 I know from experience that the canner will not rust if properly cared for. 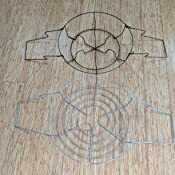 It will stand up to reasonable wear and tear, i.e. -- velvet gloves aren't needed. 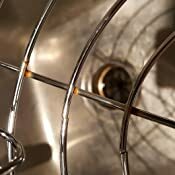 We include a dash of vinegar in the boiling water during processing, since the water in our area is hard. And there is no sign of mineral deposits in my mother's canner after years of constant use. 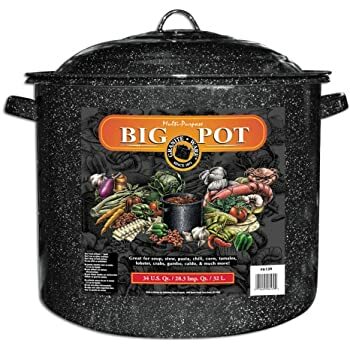 This is an excellent product, and I recommend it to anyone who is storing food for the winter. It seemed to work fine, but the rack is already rusting after one use. We're new to canning so it otherwise seemed fine, but because of the rust I'm not sure we can trust it to last, so it's probably going back. I'm not exactly thrilled on this particular purchase. It does fine. I guess you can't expect all that much from a canning pot. I wanted the canning rack to be better quality though. It rusted at the junctions after my first batch of canned apple goods. It also didn't hold the little 8 oz jars very well. They were hard to take out without them tipping slightly to the sides. 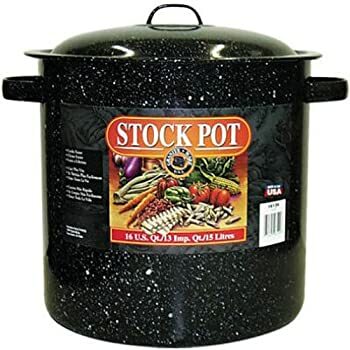 I'm decently happy with the purchase because its likely I couldn't have found another pot this size for canning for any less and I need my big stock pot to make the actual food that I'm canning most of the time anyway. In the future, I will probably look for an alternative once I feel like I've gotten my money's worth out of this one. Hopefully this review helps you make an informed decision. If your budget allows, I would recommend looking elsewhere. 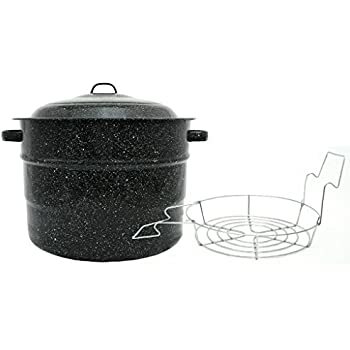 5.0 out of 5 starsThis is THE water bath canner you want! 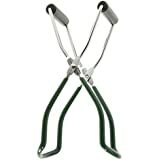 Big, classic, sturdy and cheap! This water bath canner is a classic, full-sized quality canner designed for high acid foods (jams, jellies, salsas, tomatoes, pickles, etc) and makes me think of Grandma in the kitchen. 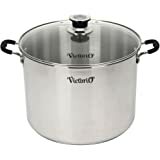 It is surprisingly not super huge but will process 7 quarts OR 9 pints OR 13 half pints at once, cutting down on the time one must sit there monitoring the canning process. 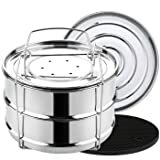 I recommend storing it in the original box, allowing you to store a few lightweight things on top of the large box, as well as keeping dust off the canner, prolonging it's finish. Storing square items always seems to be easier and neater than any other shape! I have 7 lbs of pears ready to be split into two recipes: vanilla bean pear jam and salted caramel pear jam ready to go now that I have this baby in hand!! I bought this to replace a very old canner that had finally had a pinhole leak. But I have the foresight to save the old rack. And it's a good thing I did. The new, shiny rack is nearly useless for canning. 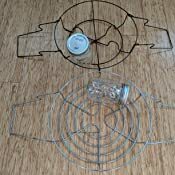 The old one had wires formed to hold individual canning jars to aid in keeping them upright when submerging and removing from the canner. The new on is completely flat on the bottom. The boiling water topples jars making it very difficult to right them and remove them without them tipping over again. In photos, the one on top is the old rack, the one on the bottom is new. I really wanted this to work! 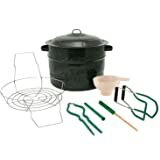 I bought this to brew beer and to can. I received the pot in the mail today and went straight to work brewing a batch to see how it holds up. Fast forward 40 minutes into the boil and I see black flakes floating around in the beer. Thinking it was better to err on the cautious side, I dumped out $30 worth of beer through a screen. Sure enough it was what I was expecting. 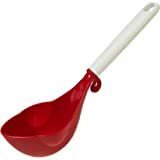 The bottom had begun to flake after just 40 minutes of use doing nothing but boiling wort on a low role using a commercial plastic "oar" for stirring. I guess it's fine if you literally use it to just boil water that won't come into contact with food. The pictures are taken immediately after dumping the beer with no cleaning or interference from me. This pot was very well packed with lots of parchment paper cushioning the product. 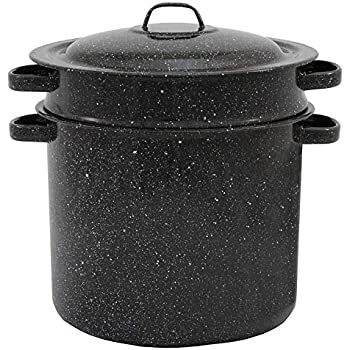 I grew up using one of these granite pots for making pickles. I have recently decided to start canning my own food since I have moved out of my parents home and have made some Grape jam. I also used the pot to sterilze quart jars in order to make sauerkraut using the raw fermentation method. I really like the size as well as the simplicity of the product. 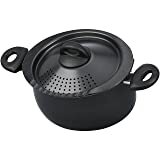 I had no issues using it, the only thing is that boiling so much water takes quite some time. 5.0 out of 5 starsYes, they can chip, but if you are careful, they will not. I've seen the reviews that say these chip. At this price point that can happen, but I use them to steam large amounts of fabric and yarn and have not had a problem. I clean them carefully when I am done and store them with paper towels between them and never with the wire racks in. I have not had a problem. Which is good. If I do chip them I cannot use them anymore. The colors can be compromised. 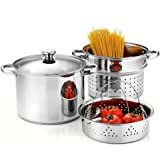 I'd love a $200.00 set of stock pots in stainless, but until then, these work well and the canning jars can pile neatly for steaming different colors, or I can place five yards of material in at once. Excellent price point if you are careful. Once they are used for dyes for clothing, they cannot ever be used for food, so they must stand up. I have no recycle options with them.